Look, I love Velveeta. I’m not even trying to hide it. I would walk down the street with the Velveeta block in my hand nibbling on it if society would not frown upon that. Instead, I will sit at my desk and eat it. I love everything about it. I love it cubed. I love Velveeta macaroni and cheese (it’s the best). If you don’t like Velveeta I’m not sure if we can really be friends (just kidding, sort of). 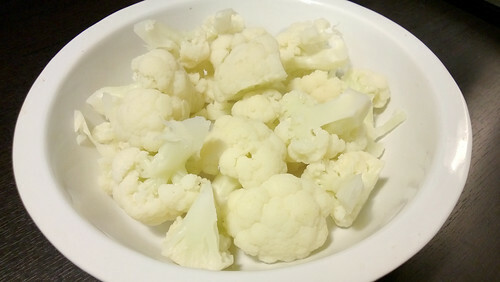 I also love cauliflower, it’s yummy and good for you! 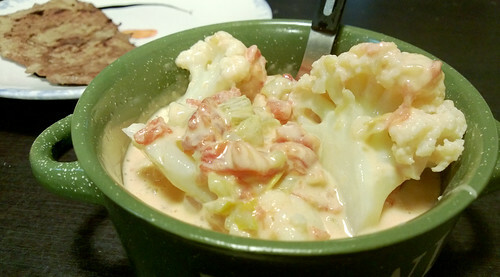 I bought some cauliflower a few days ago and planned to make cauliflower soup but today I was craving cauliflower and cheese, so that’s what I made for dinner. 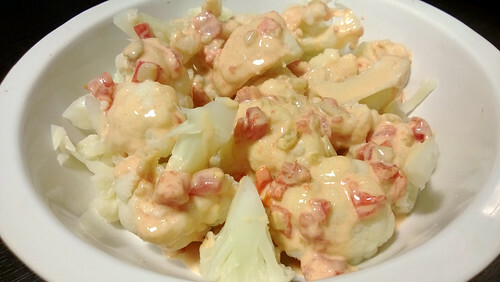 I know cauliflower is good for you, but this recipe probably wouldn’t be considered healthy so just a warning. This was a big hit, as soon as Matthew tasted it he said “Write this recipe down!”. Calm down man. 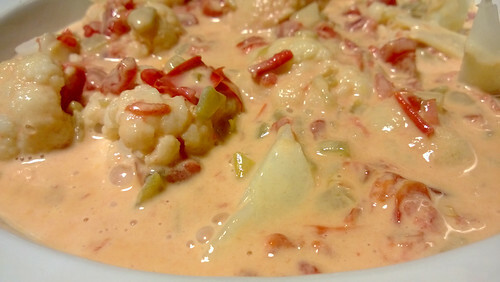 I love this recipe on a cold night, or just a “cheer me up” meal. 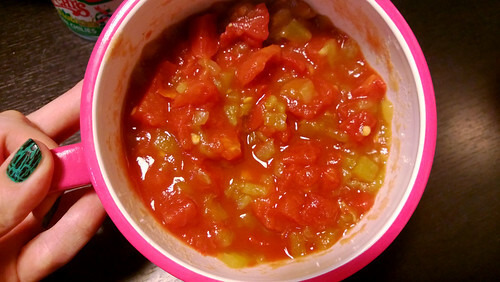 It’s very delicious and quick to make. It also only needs a few ingredients! 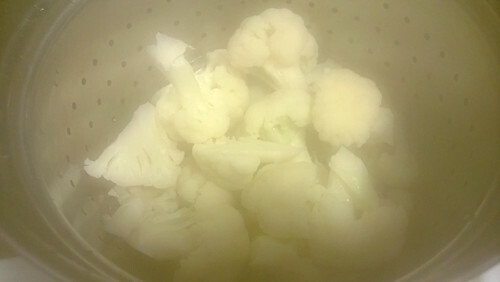 Steam your cauliflower for a few minutes until it’s tender but still has a crunch. 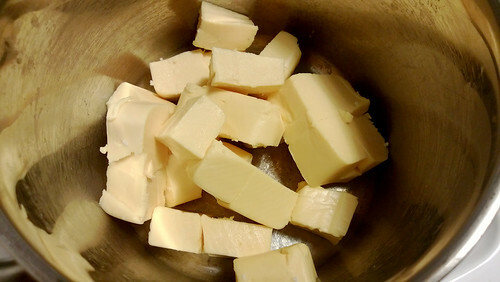 Cube your Velveeta. Take one cube and just eat it. 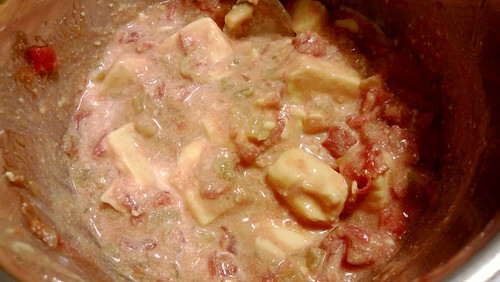 Put Velveeta, diced tomatoes, chiles in a small pot over medium low heat. Keep stirring until it’s melted completely. Full walk through behind the cut. Cut your cauliflower head up. 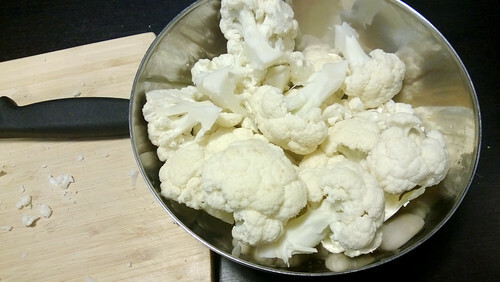 Isn’t cauliflower beautiful? Steam it. When it’s ready, drain it, then put back in a pot and put a lid on it. This will keep it warm. 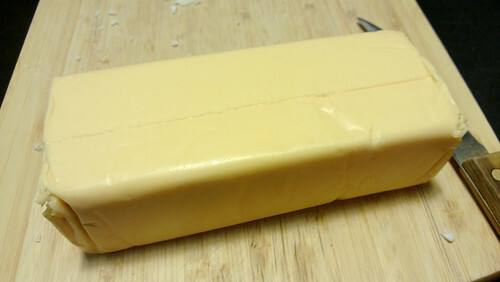 Here’s your Velveeta block. Man it’s lovely. I dare you not to eat some of it right now. Not only did I eat it, but Matthew cried for a piece too. It has that effect on a person, it will bring you to your knees! 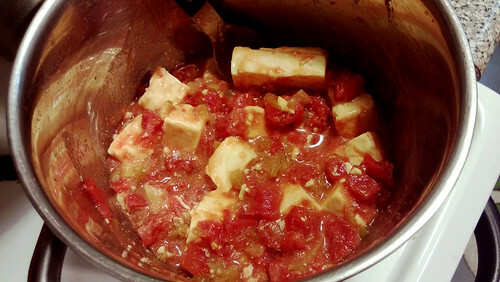 Cube it up, put it in a pot/sauce pan. Your other 2 ingredients. 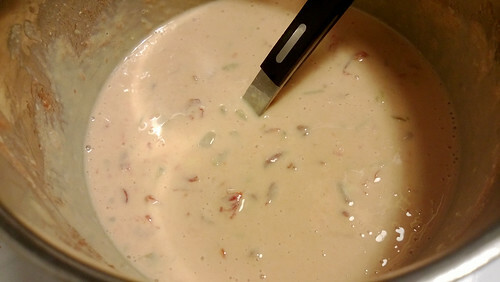 This is basically Rotel Mexican tomatoes, but I can’t find them sometimes, so I just make my own. 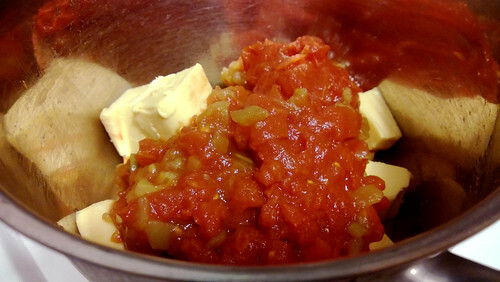 Add it in with your cheese. It should be on medium low heat. And when it does, it’s a beauty! Take a taste.. a few of them.. I’m not telling anyone. 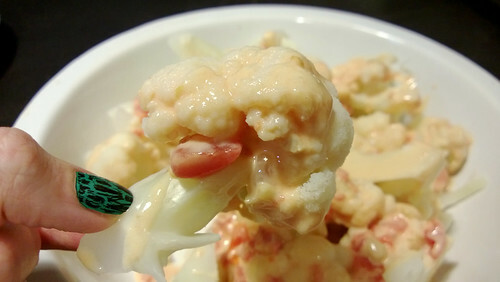 Put your cauliflower in a nice dish. It should still be warm. Or all of it. I like to put my heart into things 100% so I opted for full calories. The smell is great. Look at how pretty those tomatoes are. 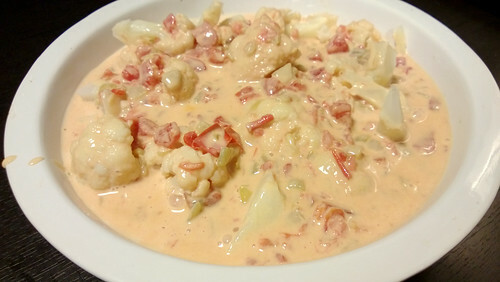 When you eat it, the tomatoes and chiles stick to the cauliflower so you get a taste of everything. Also you might want to it with a fork. Or use your hands. Again, I’m not telling anyone. 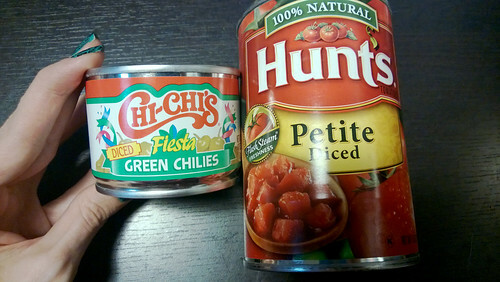 Serve it as a side dish (I made it with steak). 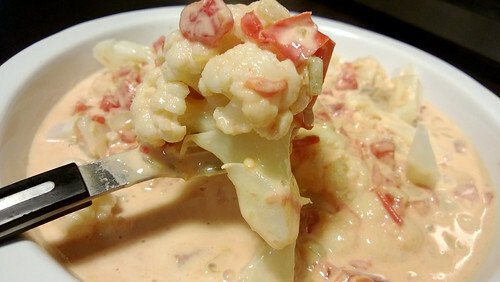 You can alternatively not use cauliflower at all and just make the cheese/tomatoes/chiles as a great cheese sauce dip. I bet you would be a hit at parties.